ALL of our buildings are Proudly 100% Made in America! They hide this fact because their buildings are not made to our high manufacturing standards! 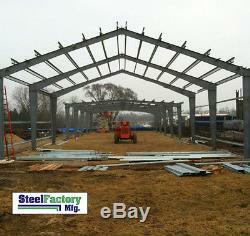 Steel Factory Mfg offers unsurpassed experience and integrity that only experienced building professionals can offer. And all at the lowest price guaranteed! Have a specific question about this listing? You'll be glad you did. 50' wide x 100' long x 16' high. Building Code: IBC 12 Snow Load: 20 lb per sq ft Wind Load: 110 mph Exposure: C Collateral Load: 1. Loads can be adjusted for local code. Frame Type: Clearspan / Factory Welded I-beam. Roof Slope: 1:12 pitch Profile: Gable. Galvanized Girts and Purlins (much higher quality than red oxide sprayed) Heavy 26 gauge roof and wall sheeting. PBR profile provides greater overlap compared to industry standard. Left Endwall: Bearing Right Endwall: Bearing. Framed Openings: (2) 14x14, (2) 3x7 Doors: N/A. Construction Drawings and Stamped Engineered Blueprints Included. What you need to know when shopping for a rigid frame building: Most people think the term "red-iron" is standard for these types of buildings, when in fact red-iron buildings are actually entry level buildings that are typically "bare minimum" packages. Lower quality, less framing, thinner material, rough cuts etc. Many companies offer these because they are cheap. The absolute most common mistake customers make is to shop based solely on size and price. Doing this can get you a low quality building that will give you headaches on site. We want you to know every detail about our buildings!! The more you know, the better we look! Our building packages offer a huge difference in quality and workmanship over red-iron packages! Here are just a few items to note. Included Upgrades: · All secondary framing including girts, purlins, base angle, end columns, door frames etc. Are galvanized for superior rust protection! No need for paint like red-iron! · Clearspan design has no interior posts or low beams. This translates into 100% interior usable space! · High Quality, Energy Star Efficient AZ-55 Galvalume (55% AL-Zn alloy) Roof. · PBR (30% greater overlap than competitors R panel) roof sheeting 26 gauge rated 80,000 psi. · 26 gauge walls include a state of the art Silicone-Polyester color wall-sheeting. · Upgraded sheeting fasteners Standard! · Tension Cable/Rod X-bracing package for extra wind strength included! Primary I-beam Columns: We use water based, lead-free and chromate-free, rust inhibitive gray alkyd enamel primer, that dries quickly and meets the performance specifications of FS TT-P-664. Galvanized Secondary Framing: Most companies only spray their frame systems with a red-oxide primer which needs to be painted and sealed to prevent against rust. We utilize all galvanized materials which do not require any paint or sealant. All secondary framing can be left bare with no detriment to the life of the steel. Galvalume Roof: EPA Energy Star standards requires that a roofing material must have an initial reflectance greater than or equal to 0.65 and maintain a reflectance of greater than or equal to 0.50 after 3 years weathering on a roof. Our AZ-55 Galvalume maintained an average of 0.78 initial reflectivity and 0.58 weathered reflectivity. We do this to ensure your building package arrives at your job site the same way it left our factory, in perfect condition. We guarantee your building will arrive safe and without damage. It will be the customer's responsibility to offload the truck on arrival. Engineering and manuals are sent out within three to four days. I-beam Frame Buildings typically take six to eight weeks depending on complexity. Permit drawings are sent out within two weeks. 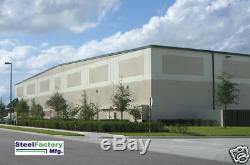 Steel Factory Mfg - 7491 N. Federal Hwy Ste C5-315, Boca Raton, FL 33487. The item "Prefab Metal Commercial Building 50x100 Steel Factory Mfg US Made Lowest Prices" is in sale since Sunday, January 20, 2019. This item is in the category "Business & Industrial\Building Materials & Supplies\Modular & Pre-Fabricated Buildings". 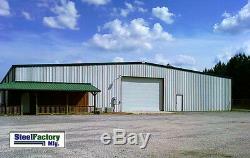 The seller is "valuesteel" and is located in Ambridge, Pennsylvania. This item can be shipped to United States.